«Three/four releases a year is the average production coming out of João Ricardo's lab, making him a very busy artist and producer. Even with such a rate of releases, quality is not an issue, as João - aka Operador de Cabine Polivalente (OCP for short) does always really interesting works. «Don’t let the initial softness of João Ricardo’s new release on the Test Tube netlabel, Stepping Stone, lull you into any sense of comfort. Fissures will strike, and small noises will make themselves known, in rhythmic patterns that are more verbal than metrical, more about the insinuation of life than about effecting momentum. Those early, subtle swells, given texture from an economical employment of static, eventually make way for a suite-like, long-form, half-hour performance (MP3). Later in the piece, alternate techniques will be brought to be bear on string instruments, heard in looping patterns of loosely strung guitar, then smatterings of rough percussion, then dark and claustrophobic scratchy explorations, before closing with an almost soothing (key word: almost) stretch of minimalist sound design. 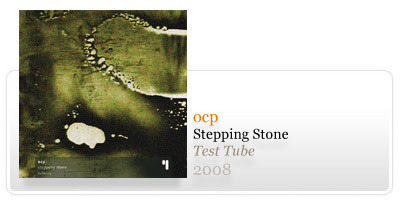 Stepping Stone is, admirably, a single-song release, which is a format particularly suitable to netlabels, where music is made available for free download and distribution by the musician and releasing organization. The compression of the musical experience into one, individual, standalone track adds to the immediacy of the experience, and thus to the sense of unmediated communication between artist and audience. ocp + test tube, isto é um "casamento" com tudo para dar certo. assim que tenha a minha net de volta (está avariada e estou a "roubar" a da vizinha), saco e comento.